We've made a HUGE $10,000 price reduction on the Highpoint 'Sonora' model - Now Only $149,900. This home has a gorgeous, modern and open-concept 1,520sqft floorplan with great design and maximized space! With 3bdrm and 2bath, this home has a computer workstation off the dining area, a mudroom and many upgrades such as under cabinet lighting and stainless appliances! Stop by and visit this showhome today! We are clearing out this amazing showhome!! The Chadron offers 1672 sq.ft. with 3 bedrooms and 2 bathrooms and is loaded with upgrades. Priced to clear at $169,900 - includes delivery and an insulated skirting package - WOW!! Call Marg today for more information on this incredible home. Take advantage of our last Factory Direct Special we have available for the amazing low price of $136,900. 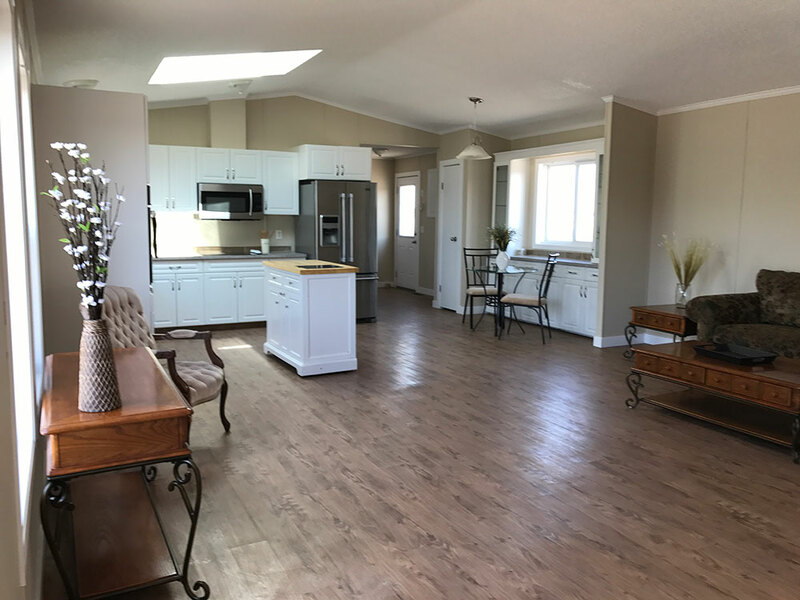 The Aberdeen is a 20’ x 76’ home that features a great open concept floorplan with 1520 sq ft of living space and is available for immediate delivery. This home includes 3 bedrooms and 2 bathrooms with many upgrades including stainless steel appliances, separate tub and shower in ensuite and a huge walk-thru pantry. Price includes delivery, blocked, leveled and an upgraded skirting package installed – WOW!! We currently have a used home on our lot. This is a 20' x 76' Moduline home that was built in 2006. With 1520 sq.ft. this home features 3 bedrooms, a media room and 2 bathrooms with a great open concept floorplan. This home comes with stainless steel kitchen appliances and a washer/dryer. This home is in great condition and has recently had the entire interior repainted. This home is priced at $99,900 and includes delivery within 500 km's of Lethbridge. For more information on this home please contact Marg at 403-380-7037.